RUSH: Joseph in Edgewater, New Jersey. Hey, Joseph, I’m glad you called. You’re next. How are you doing? CALLER: Hey, Mr. Limbaugh. I’ve been listening to you since I’ve been in my child booster seat in the back of the car. I’m 20 years old, a Millennial, not the type you would think that would be a Trump supporter, but I am. I have been from the beginning. I just wanted to say one quick thing. As Millennials, you know, we’ve grown up on the internet; we’ve grown up on Twitter. In fact, when Twitter came out, I was still in middle school. RUSH: Right. It’s like your air and water. I mean, your survival. RUSH: So you think he’s hurting himself here then with all the tweets? CALLER: — you know, we’re looking like we’re fighting amongst ourselves. And we are. We’re obviously not all Republicans. RUSH: I understand what you’re saying, but as far as he’s concerned, he loves it, number one. Number two, I think he looks at it as the only way he can get his side of the story out, given all the fake news. I think your comment may be apropos about the content of the tweets. RUSH: Our last caller… I’m really sorry I ran out of time. But he did great. He got his point in with brevity, which is the soul of wit. He said that he’s 20 years old, and as a Millennial, the kind of tweets that he sees the president doing are the kind of tweets that he and his buddies did in high school, when they’re calling out people. And he said it seems… He doesn’t know how it appears to “the old people” out there, but to… (laughing) To him, it comes across as a little childish or immature. So I have Trump’s tweets for the last two days, and let’s review these things, and I’ll see if I can pick out the ones that our caller was talking about. Let’s start with — da-da-da-da — his Sunday night tweets. There’s a bunch of ’em, and these tweets, by the way, had to coincide with the appointment of Scaramucci as the new communications director. Scaramucci has said, among many other things, that he just wants to unleash Trump. He wants to let Trump be Trump. Which tells me — ’cause I thought Trump was being Trump all this time. Now, I want to reiterate: Trump loves Twitter. He loves doing this. But he also thinks it’s the only way he has to actually get his words out there, in contradiction to the fake news. He’s got plenty of media supporters, but you can’t do interviews every day, all day, all the time. So Twitter is a way to get his own thoughts and his own ideas out there. I think a lot of people that are, you know, not Generation Y, not Millennials, don’t have a problem with it. But this guy said that the Millennials do. Next Trump tweet: “It’s very sad that Republicans, even some that were carried over the line on my back, do very little to protect their president.” How does that sound to you? (interruption) You love that one? Mr. Snerdley, the Official Program Observer, loves that one. “Very sad that Republicans, even…” I would venture… I should have kept our young Millennial on the line to run through these with him. My guess would be he doesn’t like that one. It sounds too defensive. The guy’s president of the United States. What’s he doing complaining about? Don’t make yourself out to be a victim. You’re the most powerful man in the world by virtue of the office you hold. Why sound like a victim? “It’s very sad that Republicans, even some that were carried over the line on my back, do very little to protect their president.” Look, I understand the sentiment. I just got through talking about it a half hour ago. The Republican Party has more power than they ever dreamed of having, more power than we ever dreamed they would have. They’re squandering it. They are not using it to advance an agenda. They’re not using it to defeat an agenda, other than maybe their own president’s. Not all of them. But clearly — and I know people are saying, “Well, the Republican Party today is so diverse; it’s like trying to herd cats.” Are you telling me that we can’t come up with…? See, this I think is the essence of the problem. In my lifetime, we have never faced a larger collection of extreme, radical opposition. I mean, the Democrat Party has become farther left. It’s become more extreme. It has become questionable in its devotion to America as founded. I’ve never seen anything like this. The Democrat Party’s always had a bunch of extremists in it and their supporters have always been, but they’re unified. The Democrat Party is not all that diverse. My point is that we’ve never had a greater opportunity to contrast what we believe with what they believe. And we’re not even doing that. We’re not even taking the time to inform the American people how destructive the Democrat agenda is. And, by the way, even though they claim they can’t come up with any ideas. They’ve got an agenda. The problem is they don’t dare be honest about it, but they’ve got one, and their agenda is the total transformation of the United States. And it’s abundantly clear if you just listen to what they say and listen to what they oppose. It is abundantly clear. It is a golden opportunity for education, a golden opportunity to inform people, a golden opportunity to contrast. Never better! There’s never been a better opportunity to we’ve got right now to draw that distinction between what we believe and who they are. It’s being squandered because there are many people inside the Beltway on our side who doesn’t think that anything is particularly odd right now. They mock the idea that the nation is in crisis. They mock the idea that the future of the country is at stake. They think that’s laughable. Because where they live it may be laughable. Where they live they’re happy to be in the club, even if it means perpetual second place. They’re happy to be there. Their economy is functioning. They don’t have to deal with many of the problems the rest of the country does, so what could be so bad? They don’t have to deal with the problems of illegal immigration or all these wacko cultural things the left is doing. So, you know, Trump in this tweet says they’re doing very little to protect their president. I understand the sentiment there. Next tweet: “It’s hard to read the Failing New York Times or the Amazon Washington Post because every story/opinion, even if should be positive, is bad!” Well, there’s nothing to argue about. That’s true. “If Republicans don’t Repeal and Replace the disastrous Obamacare, the repercussions will be far greater than any of them understand!” Now, that’s all true. But I’m just going to have to tell you: Why does the president separate himself from the Republicans on this? I mean, he’s as much a part of getting this across the finish line. This is what presidents do. They bring together different coalitions and they lead the way into moving the agenda forward. Never is it easy. I know as many different factions of the Republican Party exist unifying them as tough. But the fact of the matter is what’s unique about this is that many in the Republican Party don’t want Trump to succeed. They don’t want his agenda to succeed, even if they support it, because Trump’s an outsider, and they don’t want an outsider to succeed. Insiders, ruling class. I was thinking last night about Angelo Codevilla. You know that piece is four years old now or maybe seven years old now, the ruling class piece that he wrote in the American Spectator that I came across. He ended up writing a book on the premise, and I wrote the foreword for it, in which he explained to everybody what the establishment is and who they are and what it is that motivates them, what they do to protect themselves. 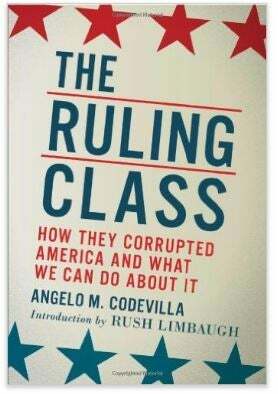 He called them “the ruling class.” We call it “the establishment.” But it was bingo, and we face a lot of things. Many in the president’s own party and all of the Democrats want him to fail simply because he’s not one of them. Even if they approve of the president’s agenda. It’s a unique set of circumstances. But in that case, it calls for the president to be involved even more. “If Republicans don’t Repeal and Replace the disastrous Obamacare, the repercussions will be far greater than any of them understand!” That’s all true. And I really do believe that if that happens, if nothing happens with Obamacare being repealed, I don’t think President Trump is going to take a majority of the heat, because it’s the Republicans who’ve made these never-ending promises for seven years about this. But even so, the president’s the author of The Art of the Deal, getting things done, supreme negotiator. Getting these people in a room and making them do what’s right and what’s best according to whatever parameters: the party agenda, the president’s promises, individual members of the Congress and the Senate and their promises. And then he gave a shout-out to Lou Dobbs. “Thank you to @LOUDOBBS for giving the first six months of the Trump Administration an A+. [Supreme Court], reg cutting, Stock M[arket], jobs, border etc. = TRUE!” And then there are five other tweets that happened this morning. “Drain the Swamp should be changed to Drain the Sewer — it’s actually much worse than anyone ever thought, and it begins with the Fake News!” All true, again, but why is he writing of this stuff as though he’s a bystander? Why is he writing of all this stuff as though he’s an observer? He said he was gonna drain the swamp. Now it’s the sewer. What do you do with plugged sewers? You go out there and get Roto-Rooter! Have you ever hired Roto-Rooter? (interruption) Have you ever needed Roto-Rooter? You know why you need Roto-Rooter? Well, in addition to all the obvious, you’ve got tree branches that find their way into the sewer lines. You’ve gotta root ’em out of there. It’s an ugly process. The plumber comes in with his snake, his machine, plunges it in there into the plumbing pipe (sound), shhhh’p, starts screwing around in there. The junk that comes out of there, that’s exactly what he’s talking about, rooting out the sewer. But he’s not a bystander in this. You know, fire all of the Obama embeds. Fire the Obama holdovers at the DOJ, the Pentagon, the State Department. Get rid of the Clinton people who are hanging around the EPA, what have you. He’s not a bystander. He was not elected to be a bystander. I’m not saying he is but the tweets come off could be interpreted that way. “After 1 year of investigation with Zero evidence being found, Chuck Schumer just stated that ‘Democrats should blame ourselves, not Russia. '” (sic) In a sense, that’s true. Chuck You was on the Sunday shows, and he did say that they’ve got an agenda put together. They’re putting together an agenda of ideas to give people a reason to vote for them. He did allude to fact that they can’t live off Russia alone. But that’s just for consumption on the Sunday show. That doesn’t mean that Pencil Neck Adam Schiff’s gonna shut up. It doesn’t mean that all these people are gonna stop focusing on Russia. This is just Chuck You giving the Democrats cover and giving the media permission to start reporting on the Democrats in ways other than their focus on Russia. And then he did tweet about Pencil Neck. He said, “Sleazy Adam Schiff, the totally biased Congressman looking into ‘Russia,’ spends all of his time on television pushing the Dem loss excuse!” meaning: Schiff’s on TV all the time blaming Russia for the Democrats having lost the election.